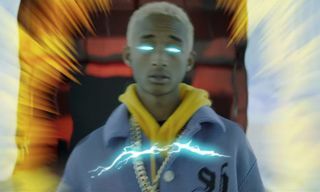 Is Jaden Smith a Gotham fan? Maybe. 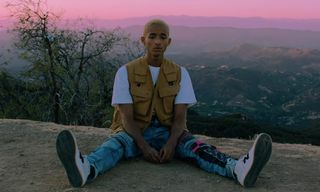 The progeny of two of Hollywood’s most beloved certainly channels the show’s young and lonely version of Bruce Wayne in a lo-fi music video for his single, “Batman.” Jaden also sports the same custom-made white Batman costume he famously wore to Kim Kardashian and Kanye West’s wedding. 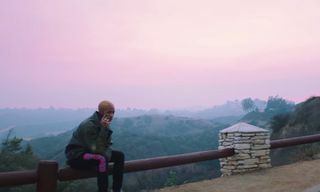 Between scenes of Jaden training, reading and learning as Bruce, there are also moments that capture him wandering through Los Angeles dressed as the caped crusader. Instead of battling the villains we’d expect, Jaden’s Batman instead has showdowns with Superman, Spider-Man and another Batman – this one in the traditional costume. 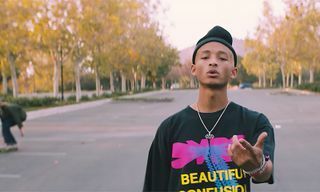 Though the MSFTS creator recently cut all of his hair off – which he then brought along to the MET Gala – it’s all present in the video, which gives us some insight into when it was shot. Frank Ocean’s Boys Don’t Cry zine also makes a subtle yet somehow very prominent appearance, which, when juxtaposed against the superhero character of Batman, becomes a seemingly intentional commentary on the fragility of masculinity. 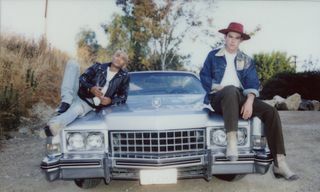 The video was directed and edited by Moises Arias, who though far removed from his days on Disney Channel, is still recognizable to most millennial as Rico from Hannah Montana. Press play to enjoy and also check out Young Thug’s bizarrely violent new trailer here.